Volunteers are very important people at Esopus Creek Conservancy. In recognition of their contributions and accomplishments, ECC will feature outstanding volunteers on our website throughout the year. The ECC board of directors voted unanimously to give its 2008 Volunteer Recognition Award to Chris Florsch for his untiring efforts, extraordinary leadership and many accomplishments on behalf of ECC during the past five years. Florsch, a former ECC board member and current chair of ECC’s stewardship committee, leads the committee in developing and maintaining the trails throughout Esopus Bend Nature Preserve, restoring and maintaining the meadow, organizing volunteer work parties, and is largely responsible for the general day-to-day care of the preserve. Florsch meets quarterly with stewardship committee volunteers on site, walking through the 161- acre preserve, planning new projects and identifying areas that need attention. His insightful stewardship is guided by an intimate knowledge of the preserve gained from a lifetime of excursions on the property. Growing up in the Barclay Heights neighborhood of Saugerties next to what is now the preserve, Florsch, as a child loved exploring the land from the time it was the Schroeder farm. He continues to share his love of this special place with his two children – Kristin, a teacher in the ECC Environmental Program, and John who works on ECC projects. His two-year old granddaughter, Avery, often accompanies Florsch during nature walks on the preserve. With spring here and summer on the horizon, Florsch and the stewardship committee volunteers are completing the South Bridge and starting a wetlands boardwalk to enhance the experience for the many hikers and nature lovers who visit Esopus Bend each year. Florsch will receive the recognition award at a ceremony upon completion of the South Bridge. Two volunteers who work with the ECC have a very close relationship with the conservancy, not only in philosophy but physically as well. In fact, they live right next to the Shady Lane entrance to Esopus Bend Nature Preserve. How much closer can you get? Joan and Chris Pappas have been consistently active with the ECC since the call for volunteers went out in 2004. Joan serves on the fundraising committee, and Chris does lots of photography and general upkeep on the Preserve. Chris is originally from the New York City and Joan is from Peekskill, NY. Chris came to the Saugerties area in 1956 when he went to work as a technician for IBM. They married in 1956, settled in Lake Katrine, and then came to Barclay Heights in 1961. According to Joan and Chris, what brought them to Saugerties at that time was the affordability. Joan and Chris were the second family in the Barclay Heights development and chose their site because it was near the woods and the creek. But it was not without problems. “There used to be dirt bikes and motorcycles in the woods. And it was a dumping ground. There were about a dozen cars down there that we took out. 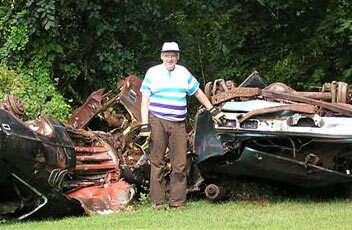 There were refrigerators, a bathtub, parts of a car and an engine,” said Chris. Joan describes herself and Chris as “the gate-keepers.” “We have a motion detector light on the house so no matter who passes by at night, the light goes on. Plus we got a street light because I went to the board meeting one time and set that up and got it passed,” said Joan. Joan’s work on the fundraising committee is considerable: attending meetings, selling the exquisite Charles Townsend Glicee reproduction print, A View from Barclay Heights, and the specially designed ECC T-shirts to help raise much-needed funds. “As far as Esopus Bend is concerned, I’d love to see the trails filled in and more trails made. I think that will happen. I’d love to see the footbridges go in. I want to see more hikers. I’d also like to see park benches along the paths so that the people can sit along the way.” Joan explained. 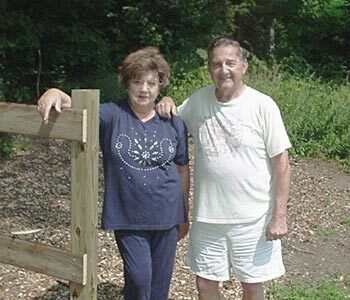 Now others can appreciate that peace and beauty at Esopus Bend because of the hard work and dedication of volunteers like Joan and Chris Pappas. 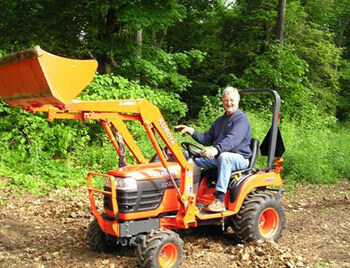 Ron Le Blanc is among the hardest working citizens in all of Saugerties. He served four years on the town board; and served on the school board. He was involved with the Saugerties Area Mobility Analysis (SAMA) and is on the recreation committee. .I’ve had my nose in so much stuff,. is the way Ron explains his community involvement. He applies amazing energy to his life and to his volunteer work which includes his service to Esopus Creek Conservancy (ECC). But, first things first. At age 18, after one year of college, Ron joined the Air Force, where he served in the Air Research and Development Command for four years. Following military service, he returned to school, finished college, and went on to earn his master’s degree. Ron joined the Kingston school system in 1961 when he and his wife Suzanne moved to Saugerties. Ron started his career in education as a teacher, then went to the central board where he later became assistant to the superintendent. While there, he wrote many grants to enhance the Kingston school district.s outreach efforts. But Ron decided to return to the classroom, eventually became a principal, the position from which he retired. According to Ron, the bridges are the big project right now. .One is constructed, and the other is a major undertaking because we have to span 50 feet. And the bridges are hard to construct because of all the materials that have to be brought onto the site. That’s the real serious task. The rest of it is maintenance – the trails and all that . which are less labor-intensive,. Ron said. Regarding the current First Annual Fundraising Appeal, Ron says, “The Esopus Creek Conservancy provides an invaluable asset to the Saugerties community. I totally support this concept and am proud to associate with such an important endeavor. Esopus Bend Nature Preserve deserves the support of the total community. I hope that the current fundraising drive is enthusiastically supported..
Ron, thank you for your volunteer work and dedication, and happy Sawyering. In recognition of his service to the ECC, Ron received the 2006 ECC Volunteer Recognition Award at the Charrette Update on September 15. When asked to serve on the all-important ECC Stewardship and Land Management Committee, Newton agreed. “Ray is a very reliable volunteer who has demonstrated a real commitment to helping out, said former ECC Stewardship and Land Management Chair Ron Le Blanc. Why did Newton get involved? Like so many other Saugerties residents, Newton believes in what ECC is doing. “The whole concept of creating a nature preserve in Saugerties is a terrific idea, and Esopus Bend is a neighborhood jewel,” said Newton. The neighborhood he refers to is Barclay Heights, a residential area developed in the 1960’s. Newton, who grew up in central Pennsylvania, chose to live in Barclay Heights when he came as an engineer to work at IBM in Kingston in the early sixties. He did not want a city environment. That choice to live near what is now Esopus Bend Nature Preserve gave him an appreciation of the land and influenced his decision to become an ECC volunteer. Now retired from IBM, this active senior citizen said he has the time and the interest to help out. “It’s such a worthwhile effort and a lot of fun,” said Newton. Newton is looking forward to the next important volunteer tasks at Esopus Bend – to complete trail work, post needed signage, and finish clean-up tasks on the property so it can be opened to the public. You can help the Esopus Creek Conservancy in many different ways. Fill out the form and tell us the how you can volunteer. Choose one or several. Any way you can contribute your time is very much welcomed. Esopus Creek Conservancy cannot exist without volunteers just like you. Your personal information is precious to you. We appreciate your privacy therefore we DO NOT share your information with any third party.